A lens refracts light and creates an image that is either virtual or real. According to Georgia State University, virtual images are formed at the location where the paths of the primary light rays intersect when projected backward from their direction beyond a lens. A real image is formed where the light originally converges. Mirrors reflect light and create images in a way similar to a lens, depending on where an object is located in relation to a mirror. A convex lens is thicker in the middle than on its outside edge. As a result of the middle being the thickest part, light traveling through the lens converges into a single point. Parallel rays of light join at a single point beyond the lens. How an image appears in a convex lens depends on the distance and position of the object being viewed. If an object is within focal distance, it will appear like a "virtual image"--i.e., right side up and larger than the actual object. An image beyond focal range will appear upside down, and such an image can be smaller, larger, or the same size as the original image. Concave lenses are thicker on the ends and thinner in the middle. They divert light rays away from a focal point and only create virtual or smaller images. A plane mirror is a flat mirror that sends light out from itself in multiple directions. The light is sent out by either reflection or emission. The point where the reflected light beams intersect is where the image is formed. The image formed by a plane mirror will always be the same size as the original object. A convex mirror works like a concave lens. It curves light away from its middle, like the outside portion of a bowl. 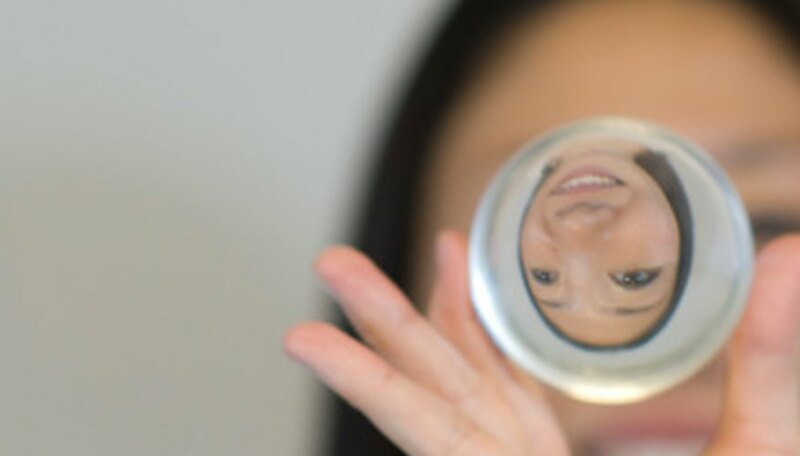 This type of mirror will produce only smaller and virtual images. A concave mirror works much like a convex lens. It bends light further away in the middle, more like the inside of a bowl. How images appear depends on the proximity of objects to the mirror. At certain distances objects will appear virtual whereas other locations will cause an image to appear larger, inverted, real, or erect. Kaine, Annabeth. "Types of Mirrors and Lenses." Sciencing, https://sciencing.com/types-mirrors-lenses-7434602.html. 25 April 2017.